With baby number two on the way, I have been snacking more than I am used to. I am also having to come up with new snacks to satisfy my ever changing cravings that inevitably pop up mid-afternoon. My most recent creation was this sinful strawberry toast. 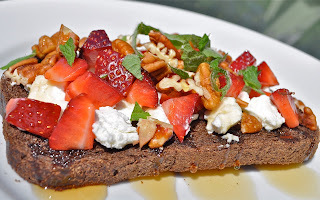 Simply toast a piece of dark pumpernickel bread and smear it with creamy goat cheese. Clean, hull and dice a couple of juicy red strawberries and add them on top. Next chop a handful of pecans and sprinkle them over the toast. Then squeeze organic honey back and forth across the toast like syrup. Finally, tear a few mint leaves up and toss them in the sticky honey. You may need a fork for this one. The tart berries and bright mint mix well with the smooth cheese and sweet honey. The nuts and dark bread ground the whole concoction. Plus, I got lots of good vitamin C, omega-3s, calcium, and fiber for me and baby. It really is was a delight. Wow. You make my knees weak with this one. Goat cheese is perfect with fresh fruit. Great work and best wishes with the new baby. Oh, boy, do I remember the need for good snacks during pregnancy! This one sounds delicious. Thanks everyone! Hope you get to enjoy this snack soon too!